Cranberry Apple Brussel Sprout Salad with butternut squash, cranberries, goat cheese & pepitas. 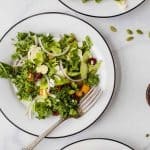 A healthy salad recipe perfect for Thanksgiving. To a small bowl add whole grain mustard, apple cider vinegar, honey, smoked paprika cinnamon, minced garlic, olive oil, salt and pepper. Whisk until everything is combined and the vinegar and oil no longer separate. Set aside. To a large bowl add kale. Add a pinch of salad to the kale and using your hands, massage the kale (by squeezing or rubbing it) in between your hands until the kale turns to a forrest green color and becomes fragrant. Then, to the kale bowl add shredded brussels sprouts, roasted butternut squash, red onion, cranberries, pepitas, sliced apple and goat cheese.